As we find ourselves in the heart of grilling season, it’s easy to get caught up in the endless stream of meat-centric recipes—after all, nothing says summer quite like a burger fresh off the grill—espeically when dinner or entertaining comes into question. And while the thought of said burger sounds particularly appetizing, it’s important to keep the healthier alternatives in mind as well. With the overwhelming number of veggie-friendly recipes out there, making the most of fresh, summer produce never looked so easy. As you prep and plan your weeknight meals or a weekend dinner party menu, give your stove a rest and take to the grill for a much-needed switch up. Ahead, your ultimate guide to grilling just about every veggie this summer. If you’ve never tried this delicious take on grilled corn before, what are you waiting for? Fresh sweet corn is grilled to perfection (i.e., with deliciously burned edges) then slathered in mayonnaise and sprinkled with Parmesan cheese and chili powder. Keep fresh limes on hand for a zesty squeeze of citrus on top. Delish! Tomatoes are a summer staple. Just when you thought you’d tried tomato EVERYTHING (sandwiches, pasta, salads, fried and green), someone thought of putting them on a grill – and it totally worked. Of course, you can still use these tasty veggies in pasta or as a pizza topper, but they’re also perfectly tasty as a standalone side. Pineapple is another fruit that likes the grill. But instead of stopping there, take yours to the next level with this delicious dessert swimming in rum sauce and topped with ice cream. What sounds like a complicated restaurant-quality dish actually only requires five simple ingredients to make. Tip: to make on the outdoor grill, use either a grill pan (which will create those lovely grill marks) or a cast iron skillet. Everything about this twist on a caesar salad looks like heaven on a plate. The creaminess, the cheese, the croutons, the deliciously charred asparagus – delish! This recipe includes complete instructions for making the caesar dressing and Parmesan croutons from scratch, but we’re betting best-quality store bought ingredients could be used in a pinch. With a bit of clever know-how, it’s totally possible to create tasty sweet potato fries on the grill. Be sure to cut into large enough pieces to keep them from falling through the grate, and top with plenty of your favorite steak or french fry seasoning to achieve that perfect salty-to-sweet ratio. This recipe includes a complete pizza dough recipe and instructions about how to achieve grilled crust perfection from start to finish. But, if you don’t have the time, a good quality store-bought dough will work too. Aside from the dough ingredients, this elegant pizza actually only calls for 6 additional ingredients, all of which pack serious flavor punch, like rosemary, garlic, and Gorgonzola. Pair with a chilled wine, and serve as an elegant brunch, lunch, or dinner (sides not necessary). Could anything possibly improve the simple goodness of an antipasto platter? Hmm…how about grilled veggies? While this is mostly about plating, we think swapping out traditional marinated veg for a few grilled peppers, tomatoes, and mushrooms is a GREAT idea. 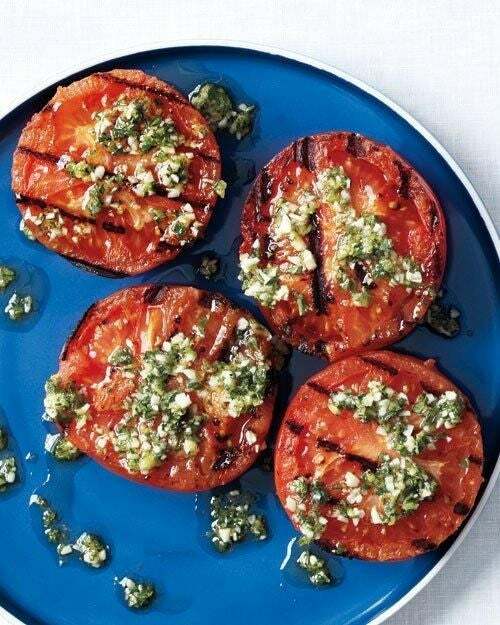 Add smokiness to delicious, fresh caprese salad by layering in slices of grilled zucchini. As much a treat for the eyes, this salad makes an healthy side with dinner, or a light and flavorful lunch. If you’re not familiar with tomato jam, it actually is sweet as the name implies, and pairs perfectly with sharp cheeses like cheddar. In case you’re keen on making a batch from scratch, this recipe includes a complete tomato jam how-to, but store bought will also work. This yummy sandwich is perfect for anyone who has a soft spot for salty-sweet food combinations (and lots of stringy cheese). If you’re tempted to make pizza on the grill this summer, start with a simple recipe like this one which couldn’t be easier. Simply grill your pizza crust until fully cooked (including those yummy grill marks) and then remove from the heat and top with a combination of fresh toppings – in this case cherries, crumbled goat cheese, and arugula. Served with a glass of chilled wine, this pizza would make an excellent lunch or light supper all summer long. Potatoes love the grill. Try them skewered with this simple 3-ingredient recipe, great for vegetarians and meat eaters alike (steak and potatoes is classic, but an all veggie feast is delish too). These spuds get their flavor from dry ranch seasoning, so bonus points for a sprinkle of fresh herbs on top before serving. Asparagus is one of those veggies that you’ve probably been making wrong your entire life. Instead of boiling them (or even sauteing in a pan) try oven roasting, which brings out their intensely nutty flavor. Now, take that idea to the next level by grilling asparagus, for the ultimate veggie treat (and a little garlic and Parmesan never hurt, either). Yes, grilled treats should also include dessert. Peaches are surprisingly delicious when grilled, and hold up well during the grilling process. Once the main dish has been cooked, pop your peaches and cherries on the grill and be prepared to drench in lots of cinnamon-honey syrup (and top with vanilla ice cream, of course). Tip: to keep your fruit from falling into the grill, cut into large chunks and slide onto skewers, which makes turning and removing a breeze. When you need a simple veggie side for your next grill, skewer a few baby portobello mushrooms and roast until slightly charred and tender. This recipe suggests marinating mushrooms first in a homemade sauce full of fresh flavors like parsley, lemon juice, balsamic vinegar, and garlic. Allow to marinate for 30-45 minutes before grilling, and make lots – they’re just as good leftover (and are even tasty when cold, too). If you’re a fan of the Pioneer Woman, you may already be familiar with this clever way to prepare summer zucchini. A quick and simple marinade packed with lemon juice and zest creates big flavor in this otherwise simple vegetable. Grill over mild heat until the spears are tender with lots of beautiful grill marks, and then top with more zest and salt just before serving (eat while still hot, of course). Yum! For a quick, fuss-free side to accompany the main dish, these foil-packed potatoes can’t be beat. Simply chop, wrap, and grill until tender. Tip: as with the oven instructions, keep foil packets on a baking tray or grill pan to prevent any tearing or leakage while grilling. If you can imagine a pineapple dessert inspired by bananas foster, this is it. Grilled pineapple dripping with caramelized brown sugar and cinnamon with buttery richness is simply too good to resist. Enough said. You might be surprised to find that flatbreads and pizzas turn out even better on the grill – something about the intensely high heat makes the crust crispy and yet deliciously tender at the same time. That said, pretty much any pizza recipe designed for the oven can be cooked on the grill, too. This flatbread is perfect for summer barbecues, since it’s full of seasonal flavors (peach and basil) and a cinch to prep with only a handful of ingredients needed. There are LOTS of yummy recipes for grilled artichokes, but you have to know how to prep a fresh choke first. Yes, in their raw form this task can seem a bit daunting, which is why this recipe provides step-by-step instructions about how to trim, steam, and prepare them for the grill (not to mention adding all of that delicious garlic parmesan butter). This is a simple recipe with LOTS of uses. Serve as a standalone salad, stuff into sandwiches, top a pizza, or mix into a delicious summer pasta. The balsamic dressing is key here, so don’t skimp on the fresh herbs or garlic (and feel free to swap in any herbs you like best). For a healthy, grilled take on traditional nachos, swap tortilla chips out for slices of grilled zucchini ‘chips’ instead. We dare you NOT to like this delicious nacho-salad hybrid, that’s as tempting to the eye as it is to the tongue. Any grilled cheese sandwich can be made on the grill, with the right equipment (cast iron skillet, grill pan, etc). This version is a bit different, however, since that deliciously crusty ‘bread’ is actually made out of cauliflower (no bread flour in sight). For a different, low-carb version of your favorite sandwich, this take on the grilled cheese is mouthwateringly tempting. If you only think of eggplant in Parmesan form, it’s time to throw some on the grill (and then top with lots of yummy vinaigrette). This makes a great side dish, appetizer, or main when diced up over a bed of hot pasta. We’re betting you never thought cauliflower could look so temptingly tasty, right? According to this recipe, when sliced into large steak-like pieces, cauliflower can be cooked directly on the grill (and the end result is amazing). An oil mixture flavored with chipotle powder, limes, garlic, agave syrup, and paprika lends lots of zesty flavor – you might even forget you’re eating cauliflower. Even if you’re not a fan of the brussels sprout, anything with ‘balsamic reduction’ in the name deserves a try. With plenty of crispy edges and the syrupy-sweetness of balsamic vinegar, we’re betting these veggie skewers are even tastier than they look. White pizzas are great for many reasons – first, they’re super tasty. And second, you don’t have to mess with the drippiness of tomato sauce, which is a bonus when grilling. This simple white pizza has us drooling over the extra yummy ingredients like mushrooms and goat cheese. Yum! A good veggie burger can be hard to come by, as they tend to be a little dry and can lack flavor. Not so with this green monster version, packed full of, well, LOTS of yummy things (peas, kale, walnuts, soy sauce, and mustard just to name a few). Pile high with your favorite burger toppings and enjoy. Tip: when making on the grill, this tender burger should be placed in a cast iron skillet to prevent spillage. A grilled cheese inspired by pizza! There’s no reason NOT to make a few of these the next time you’re grilling (in your cast iron skillet or grill pan, of course). Cut into cubes and serve them as appetizers, or swap your standard garlic bread out for this cheesy upgrade. We promise, your guests will thank you. Grill hack! This is more of a method than a recipe, but if you’re feeding a large crowd, being able to turn out large numbers of tenderly grilled corn (mess free) is a lifesaver. Instead of shucking all of the corn – which is time consuming and messy in large numbers – grill it as is within the husk. A few simple tips (like trimming off the excess silk at the top of the ear) ensures tender and juicy burn-free corn every time, all within 30 minutes. Another use for those tasty grilled veggies, you can either grill your quesadillas immediately on the same grill, or use this recipe as a way to finish up any leftover grilled veg. Cheese is a must, but this recipe recommends adding pesto sauce, too, for added flavor. These simple veggies are all about the sauce, so plan to make it from scratch. It’s cool, creamy, and a perfect contrast to the savory crispness of grilled veg. Grilled zucchini spears get stuffed and rolled into these delicious little bite-sized appetizers. Fill them with whatever you like, but this combination is the perfect triad of sweet, creamy, and briny. This story was originally published April 18, 2016.